The primary use of a dial indicator is to check parts or for machine set ups. Milling machines, surface grinders, EDM machines, WEDM’s, lathes and inspection operations are some typical examples of where you will find dial indicators in use. 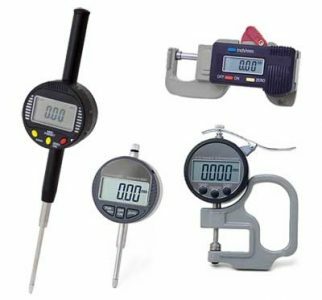 Dial indicators are tools use to compare the location of a workpiece feature to a known standard, such as gage blocks or a height gage. They are also used to ensure the location of a workpiece in a set-up, also known as “tramming it in” or “indicating it”. Both styles are versatile, but the test style is more adaptable to small, confined working areas. 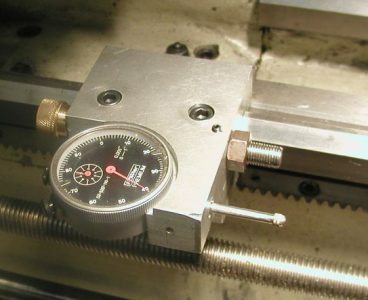 The plunger style is often used to measure linear travel over short distances, such as the depth of a blind hole, lathe carriage travel or shoulder depth on workpieces. A lever style indicator contact moves in an arc, rather than a straight line, as a plunger style does. This can result in a slight inaccuracy, known as “cosine error”, if the angle between the lever and the workpiece is too steep. Apprentices and other inexperienced toolmakers often make this mistake, with a resulting error in the measurement. For example, it the lever is offset an additional 20 degrees, the error is .0006” a .010” range. Good practice is to keep the lever as close to level as possible. Most toolmakers keep the angle between 0 and 15 degrees. This is easily accomplished and should be routine practice. 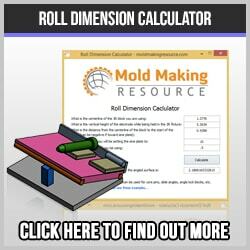 Make sure that the dial indicator is pre-loaded by 1/10 to ¼ turn before measuring. Your indicator is not much good if you have no way of mounting or holding it! There are numerous holding devices used, such as dovetail connectors, round connectors, universal styles, and split bushings to mate pieces together. The indicator point is also important. A general rule is to use the largest size practical in order to minimize false readings due to a tiny indicator tip reading discrepancies in the surface finish, rather than the actual size of the part. Other attachments include dovetail body clamps, tool post holders, swivel posts, axial supports and collet adaptors. gives a nice introduction to ISO 9001 requirements for calibration of test and measuring instruments. You need a good foundation for accurate readings. A granite surface plate is usually used as a precision measurement foundation. Along with this you need a surface gage or transfer stand to hold the indicator and move it from the workpiece to the height gage. 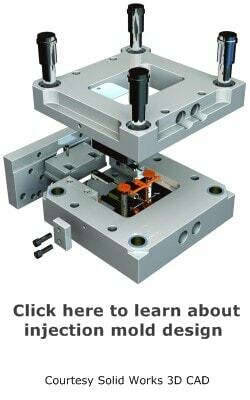 Very often magnetic bases are used for set-ups in the EDM or surface grinder. The indicator is attached to the magnetic base, which is mounted to the machine and then the workpiece is inspected. Milling machine spindles also use an special fixture to hold the indicator for tramming in holes or centering workpieces. Plunger style indicators have special handles to raise and lower the contact point. The contact points come in wide variety of sizes and styles to fit almost any job. 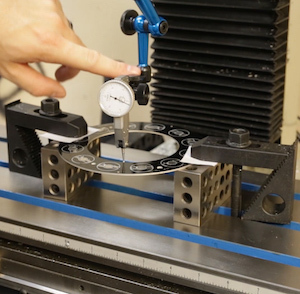 With proper care and use, the dial test or plunger indicator will faithfully help the toolmaker make set-ups and measure workpieces for years. High quality tools can last a lifetime, if proper care is taken and good practices followed.